As we all thaw out and shake-off a particularly nasty winter, it’s now time to climb out of our caves and watch the earth emerge from its slumber. Everywhere you look in West Michigan there are signs of new life, whether its ducklings or buds on trees. So let’s go celebrate the wondrous spring we have here in the area with a list of hand-selected events for you to choose from. What would spring be in West Michigan if it weren’t for the blooming of the perennial herbaceous bulbiferous geophytes (bulb) of the tulip? With literally one million tulips in bloom at both private farms and public spaces, and representing up to 75 different species, Holland is covered in tulips. Tulip Time has not one parade but three – the Volksparade, Kinderparade, and Muziekparade. The Dutch Marktplaats serves up plenty of Dutch food, merchandise, and demonstrations, while the festive Kinderplaats provides kids with a park full of activities. It is no wonder that Reader’s Digest magazine named Holland’s annual Tulip Time Festival the "Best Small Town Festival". 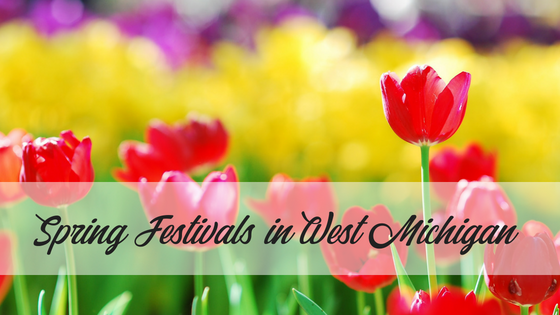 The Tulip Time Festival runs from May 5th through May 15th. Michigan is America’s second largest producer of apples with the majority of them grown on family farms all along the western side of the state. So it’s no coincidence that there are an increasing number of excellent craft cideries in the Grand Rapid area. To celebrate the current year’s batch you’ll be able to sample different ciders at stores, bars, restaurants, tasting rooms as well as straight from the source at local cider mills. The Grand Rapids Cider Week runs from May 13th through May 19th. Starting on May 1st Saugatuck Dune Rides is again offering 35-minute scenic and educational rides over Lake Michigan sand dunes and through wooded areas in one of their open-top off-road “Schooners”. Rides are available seven days a week through October. It’s best to call ahead or go online for reservations. Enjoy a day at the beach in Grand Haven State Park as the sky is filled with colorful kites of all types and sizes. World-famous stunt kite fliers perform orchestrated to music on the center flying field while kites larger than a school bus hover just to the south. Bring your own kite to fly on the open flying field at the south end of the event site. Don’t own a kite? No problem. Shop an amazing selection of kites and wind toys and spinners in the world's largest kite store for the weekend. The festival, which runs May 19th and May 20th, is free to attend, though there may be a charge to park your vehicle inside the State Park. Festival of the Arts is a free three-day community event that features several stages of performances, a juried Regional Arts Exhibition, and dozens of food booths run by non-profit organizations. Plus, creative activities for children and adults to enjoy making their own art as well as purchasing art from West Michigan artists. Every purchase at the Festival from food to art to t-shirts and posters gives back to the West Michigan community. The Festival of the Arts slips in just before the start of summer and runs from June 1st through June 3rd all around downtown Grand Rapids. And just think – spring is just the warm-up. West Michigan comes alive in the summer with more events, fairs, and festivals than you could possible attend in three months. Enjoy the spring weather, these early season activities, and please drive safely as you tour the roads of our West Michigan.